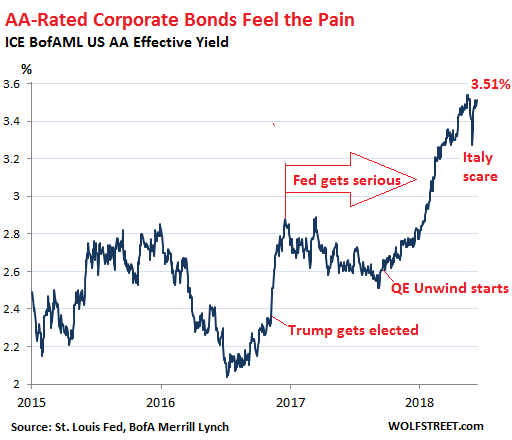 High-grade corporate bonds are “gradually” – the key word in everything the Fed says – and reluctantly coming to grips with the new era: Yields are rising and bond prices are falling. The Fed has been laboring to accomplish that. With high-grade debt, the Fed’s plan is working “gradually.” But investors in the riskiest corporate junk debt are totally blowing off the Fed. They’re floating around in their own dream world, facing a very rude awakening. In November 2016, following the elections, yields spiked. In December 2016, the Fed got serious, hiked rates for the second time in this cycle, and assumed an increasingly hawkish tone. But the market for AA-rated bonds blew it off for a while, and yields fell again. In September 2017, the Fed announced details of its QE unwind and would commence on October 1. The high-grade bond market got serious, and yields started rising again. In late May 2018, Italian politicians rattled bondholders with threats to wreak havoc in the Eurozone. This caused investors to flee from Italian bonds to safer grounds, such as US corporate and Treasury debt, and for a few moments, prices jumped and yields fell. But that scare is over. 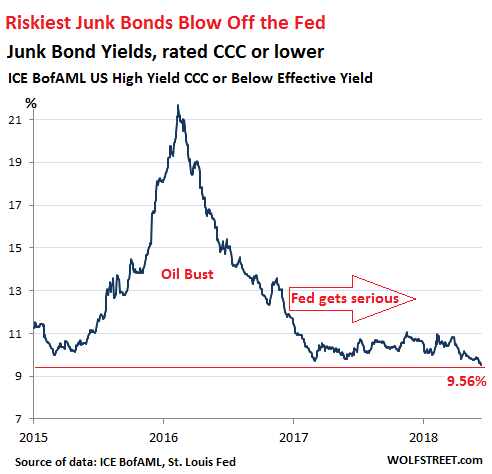 But at the riskiest end of the corporate bond spectrum, with bonds rated CCC or below (deep junk), the party that started at the end of the oil bust in February 2016 simply continued. The S&P bond index for CCC-rated bonds has risen 4.5% so far this year (compared to a 2.7% decline for AA-rated index). Since February 2016, when Wall Street decided to plow new money into junk-rated energy companies, the CCC-rated index has skyrocketed 82%. A yield of 9.56% sounds juicy on the surface. But these riskiest junk bonds turn illiquid when the selling starts. It gets brutal because buyers simply evaporate at current prices. These bonds took a huge beating during the last oil bust – see the spike in the chart above that took yields to over 20%. Individual bonds are at a high risk of default, a risk that is increasing as rates are rising, and as investors are getting skittish about giving new money to over-indebted companies so that they can service and pay off their old debts. Companies in this spectrum are cash-flow negative. They must have a constant flow of new money not only to service their old debts but also to fund their operating losses. And investors who’ve chased this yield, including bond-fund investors who have no idea what they’re holding, are in for a sudden and rude awakening – and not the “gradual” kind that the rest of the bond market is currently undergoing. Wolf, will you post an updated list with the companies with most debt that are also cash-flow negative? We all know about Tesla, Uber and Netfix but others tebd to not make the news so much. Many of these companies aren’t even publicly traded, such as the PE-firm owned retailers and media companies we’ve been discussing. Others are publicly traded. Many are in the energy sector. After a decade of super-low interest rates, there is a very large number of junk-rated companies with negative cash flows and too much debt out there. This isn’t a small part of the corporate America. As these peopel are braking the #1 rule of Currency and Bond trading. They are “fighting the FED”. Nobody does that for long, and keeps their shirt. I mostly follow energy fixed income, but here’s my two cents on this issue. The rise in yields across the high-yield/junk universe reflects mostly an increase in “rate risk.” As the federal funds rate rises, the yields on the high-yield AND investment-grade bonds alike rise, and the prices fall. This reflects the opportunity cost of holding the same bond increases, since you can achieve a potentially similar yields on a lower risk instrument as rates rise. Applying this to corporate bonds – if you hold a fixed rate instrument with a long-dated maturity in the BB-rating category (medium to high-ish credit risk, according to the agencies) and ASSUMING your credit risk is constant, i.e. nothing changes in the underlying business, then prices decrease as a result of the Fed moving the federal funds rate upwards alone, since effectively, the fixed payments from the bond do not change while the total risk (credit + rate risk) goes up. Lower value for greater risk. Price is always measured on a relative basis, so in this case, rising yields say nothing about credit risk (i.e. likelihood of default, missing a payment), and only say that the bonds have become less valuable relative to other instruments. Also, higher rates on an absolute basis will raise the pricing on the new debt that companies offer investors. That’s the only way rate risk affects credit risk I believe. It’s credit risk that should be worried about. I think most of the energy companies in the high-yield indices these days are still upstream E&P’s and /or the few remaining merchant power producers, and most coal companies (although I almost think of them as their own unique category). From what I’ve looked through, MOST of the publicly traded energy companies have positive operating cash flow. Their need to raise outside financing comes mostly from either paying dividends, funding buybacks, or financing capital expenditures. Growth capex in particular is indicative of how bullish companies are – if they have high capex budgets for the next year or two, they’re going to raise that debt – and right now everybody is drying to complete their drilling inventories, build new pipes out of the Permian, etc. So they are free-cash-flow negative on the basis that they are spending a ton on those three things above. So if capex is as accretive as the energy companies say it is (definitely a major assumption), then they should be fine. But if it isn’t, they are screwed. So assumptions on that basis inform credit risk – i.e. the likelihood that what they are building will service the debt that they’ve taken on in order to build it in the first place. As long as it is accretive enough to service debt, then a company being FCF-negative in energy is not a good indicator of credit quality. If they are FCF-negative w/ no capex, dividends, or buybacks – yeah that’s a problem. In my mind, energy companies with maturing obligations in 2019-2020 (just guessing as to the time frame for a future crisis, because there will be one) are probably in trouble. A perfect storm is: liquidity crunch caused by simultaneous massive sell-off, higher rates –> causing an inability to refinance maturing high-cost obligations, coupled with a cyclical or secular downturn in the energy industry (oil downturn in 2015-2016 is cyclical, coal demand decline is secular) If there is a liquidity crunch, coupled with higher rates, they may not be able to refinance, which I believe will be the main source of defaults. But it may also be that they can cut growth capex, cut dividends, and reduce buybacks to zero and preserve cash to ride out the storm. I don’t think it’s a matter of corporations “blowing off” the Fed. Rather, the oligarchs and grifters who control our corporations are well aware that the Fed is central to the systemic frauds and con games being perpetrated by corporate America and Wall Street financial firms on retail investors and pension funds, i.e. “muppets” in the parlance of Goldman Sachs traders. While the Fed masquerades as a responsible central bank, its genesis as “the Creature from Jekyll Island” – a tool of the robber barons – makes it clear that the gold collar criminals who are using the productive economy as their exclusive looting preserve understand full well that the Fed is part and parcel of the rackets the financial elites are running to amass all wealth and power in their own greedy hands. As such, these grifters have no reason whatsoever to be concerned with what their accomplices and flunkies at the Fed might do. The HYG is testing its highs (low yields implied, or a better credit rating?) but a high yield bond issued in a low yield rate environment will lose credit quality slower (or not at all) than a higher rated corporate bond with a lower yield. Junk is still king. The HYG and oil prices still correlate. But we are also seeing some down-and-up swings in HYG and JNK after the FOMC announcing FFR increase to 1.75%-2.00% range today. Big debt crashes in the secondary market are liquidity events. Where’s the liquidity crisis? Me, I’m too timid to go into HYG or the like at this time because I wonder about a WTF moment when even OPM looks risky in that area. By the end of next year, it will be safe to look there even for an old timid debt investor who does want want to live through a capital loss, realized or not. Better question … what about when bonds from the eurozone finally reprice to market? 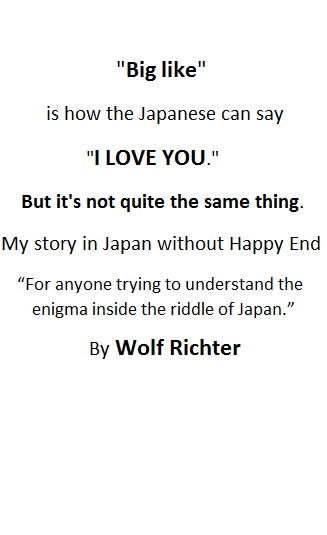 Someday, it will happen. If the ECB stops QE at the end of the year (HA HA HA HA ,,,,!) assume BIGGGG rate changes sooner than later. How will that affect HYG and the like? Second question only for debate at this time … if somehow rates don’t rise in the eurozone because ECB QE was replace by a program that does exactly the same thing but is definitely not ECB QE and anyone who calls it ECB QE will be fired, and the EU starts looking like early Venezuela, how will that affect HYG and the like? HYG: safe haven flight to safety place to be or still high risk debt? Gotta love how central banks bring stability to the world. Great job, Mario. Your place in history is assured. The bond fund ETFs are a questionable measure, do they reflect real time pricing or bonds in the aggregate? You might use the analogy of existing housing and new housing. Right now existing home prices are rising because very little new is coming to market, and suppose that despite an unfavorable rate environment that existing bonds trade higher, (because of lack of new supply?) Globally there is a surfeit of bonds and while their yields are sometimes negative, everyone who wants to trade up can’t because unless there is new supply. While US policy portends massive new issuance it might not come to pass (conservatives balance budgets don’t they?) Can they slow the pace of new issues without a credit squeeze and what happens to stocks? If you open a whole new can of higher interest rate bonds investors will reallocate. What you will get is the big bait and switch, just enough new issues to make yield hungry investors drive up the price (and drive down the yield) and they you can monetize internally and pay yourself the interest. There is no more bond market. into bonds because inflation is probably way higher than stated. Yes it will be sudden. The question is what less risky dominoes will these very risky ones tip over and then which ones will they tip over. Lehman went from a prime credit to so junky it couldn’t be sold in about a week. Well …. let’s see …. so far we’ve pumped up tech and let that burst, then real estate and let that burst …. whatever could possibly be left? Of course it will be sudden. Financial markets exist to inflict the most amount of pain to the most number of people. That’s how fortunes are made. One day you wake up and bacon is 50 bucks. Then you know it’s SHTF time. as opposed to his predecessors uncle ben and aunt janet. my question is: how many teaspoons until the taste is noticed? or, uncle sugar in reverse. A further $1.0 trillion in levered loans with little to no protection. That is $5.5 trillion of debt that’s going to become one hot potato as rates keep ratcheting up. As for corporate CEO’s cashing out, so far within the first half of 2018 share buy backs have set record highs, with May alone hitting a one month record $171.3 billion. So much for all that off shore liquidity providing capital investment and jobs. The major downside is causing the emerging market sphere financial pain as this capital is pulled back. that’s the most intelligent analysis I’ve seen this entire year…..
maybe in several years …. You’re welcome, Mark. Wish I was wrong, but after watching these Fed fraudsters and their .1% accomplices in action since 2008, it’s clear to me that the fraud is systemic. The Wall Street sociopaths commit crimes with impunity, thanks to their collusion with the Fed and our captured Justice Department, regulators, enforcers, and elected officials. Thomas Jefferson warned that this would happen to us if we ever let a private banking cartel take control of our money issuance, and he was right.